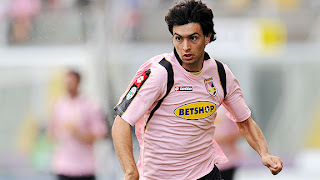 Palermo president Maurizio Zamparini has warned Chelsea, and other clubs interested in signing Javier Pastore, they must make their move in the next 15 days. The Blues baulked at the Italian club's incredible £44m asking price earlier this summer but have maintained an interest in the midfielder, who is also believed to be on the radar of Spanish trio Barcelona, Real Madrid and Malaga. Zamparini said: 'The only Palermo player that is in the market is Pastore. The situation must be resolved in the next 15 days, otherwise, the player will remain with us. Before the Copa America ends, Pastore’s future must be decided. There is a 90 per cent chance that Pastore will leave because that is his desire and when you hear about the clubs that want him it’s only normal.' Palermo confirmed last month they had received a 50m euros bid from an unnamed club to acquire the 22-year-old's services. The highly-rated playmaker, who is currently competing at the Copa America, joined Palermo in 2009 from Huracan for 19m euros and was the team's leading scorer in Serie A last season with 11 goals.